Mara Solomon didn't go to the police station to solve a murder. While reporting a routine theft, Mara Solomon, Emory University musicologist, discovers that her old friend, the harpist Lynne Adastra, has been brutally murdered. The only clue left at the scene is a piece of music, scrawled in a desperate hand by the harpist herself. The police haven't got a single lead. And Mara Solomon turns detective. Only, being a detective isn't as easy or as fun as she'd thought it would be. To decipher the mysterious harp piece, Mara must fly to Yorkshire, even though she has no idea what to look for. She has to leave behind her neurotic mother who can't take care of herself. And of course, the murderer is now after her. 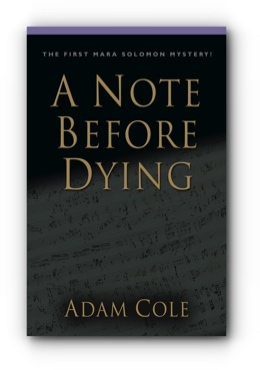 Adam Cole is the author of numerous books and articles, both non-fiction and fiction, dealing with the subject of music. His works include the groundbreaking Solfege Town and the first musicology murder mystery, A Note Before Dying.